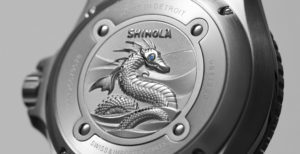 The Shinola Lake Erie Monster celebrates the long history of discovery in the Great Lakes. [DETROIT] – Detroit-based StockX, the world’s first online ‘stock market of things’ for high-demand consumer products, today announced a historic offering in conjunction with Shinola to IPO the brand’s first mechanical watch – the Lake Erie Monster – directly onto the StockX platform. Shinola’s first serialized dive and self-winding timepiece is limited to just 500 individually numbered pieces. The StockX IPO is for five unnumbered ‘000/500’ Lake Erie Monsters, with a five-of-a-kind Lake Erie Monster Tech Portfolio and a special authenticity card, and is not otherwise available to the public or to be purchased at retail. Shinola, the six-year old brand which has only ever produced quartz-movement watches, is taking a huge leap forward with its first-ever timepiece to utilize a fully automatic movement. The Lake Erie Monster, named after an unidentified creature first spotted in 1783, celebrates the Great Lakes as well as the explorers, sailors, pioneers and divers who have spent centuries discovering the wonders of the nation’s largest fresh water lakes. The watch is machined from 316L stainless steel and the 43mm case is inspired by the elegant lines of classic sailing ships and is rated for depths of up to 1,000ft (30ATM). It is powered by the Argomatic R-150 automatic movement, which features 25 jewels and a 40-hour power reserve. This is the third IPO of limited-edition consumer product for StockX. The first IPO took place in August 2016, when the company partnered with Roc-A-Fella records to launch limited-edition merchandise to celebrate the twentieth anniversary of Jay-Z’s first album, Reasonable Doubt. In January 2017, StockX partnered with Nike and the Cleveland Cavaliers on its second IPO, a package including LeBron James’ first retro sneakers, a commemorative sneaker box made from the Cavalier’s championship court, and a 2016 NBA championship ring. 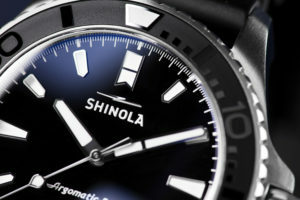 The Shinola IPO allows buyers to place bids on the Lake Erie Monster at StockX.com. Bidding starts at $2,250.00 (the watch retail price) and runs from November 7, 2017 at 10am EST to November 12, 2017 at 10pm EST. Once the bidding period has ended, the watch will be sold to the five highest bidders who can either take possession of the watch, or choose to resell on the StockX platform where trading can continue, uninterrupted. 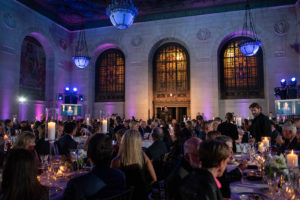 Funds raised from the bids will benefit charities in both Detroit and Cleveland who are tirelessly working to provide educational support, workforce development and emergency shelter for local families. 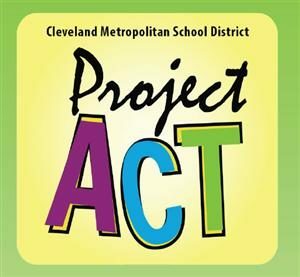 Benefitting Detroit charities include The Empowerment Plan and Detroit Children’s Fund, and Project ACT from Cleveland. The StockX process helps to establish the true market value of the product, and like the New York Stock Exchange, facilitates immediate secondary market trading after its initial release. “000” Prototype Mechanical Watch: One of just five prototype and serialized ‘000/500’ Shinola Lake Erie Monster automatic watches. With this limited-edition automatic timepiece, Shinola honors the natural beauty of the Great Lakes and confirms its commitment to quality, craftsmanship, design and innovation. Bespoke Tech Portfolio: A commemorative ‘five of a kind’ leather tech portfolio featuring a hand cut Lake Erie Monster design that is cut and sewn in Shinola’s Detroit leather factory. The Tech Portfolio is the perfect complement to watch as it features both functionality and timeless design. Metal Watch Case: A metal watch case that includes a Princeton Tech diver’s flashlight, diver’s map of the Great Lakes, a stainless steel three-link bracelet, a black rubber dive strap and black fabric strap – all easily interchangeable with included tools. Pre-IPO: Bidding opens Tuesday, November 7, 2017 at 10:00 a.m. EST. IPO Date: Bidding ends Sunday, November 12, 2017 at 10:00 p.m. EST. Winning bidders will be notified shortly thereafter. Post IPO: Once all IPO purchases are confirmed, buyers will have the opportunity to resell their Shinola IPO Package on the StockX platform. 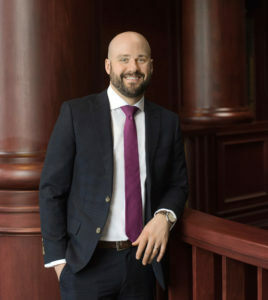 StockX, which was founded by Luber, StockX COO Greg Schwartz, and Dan Gilbert, founder and chairman of Quicken Loans and majority owner of the 2016 NBA Champion Cleveland Cavaliers, has many high profile investors including Eminem, Mark Wahlberg, Ted Leonsis, Tim Armstrong, Scooter Braun and Ron Conway. Coincidentally, StockX Co-Founder Dan Gilbert is the owner of the Cleveland Monsters, the American Hockey League affiliate of the Columbus Blue Jackets, which up until its previous season was known as the Lake Eerie Monsters. The business launched in February of 2016, currently has more than 90 full time team members, and is expected to pass $200 million in GMV run rate by the end of 2017. Detroit-based StockX launched in February 2016 and is the world’s first “Stock Market of Things.” StockX enables the buying and selling of high-demand consumer products, including sneakers, watches, handbags and streetwear. StockX connects buyers and sellers using similar protocols to the world’s stock markets – allowing anonymity and providing real-time market pricing. StockX participants can buy or sell with the full knowledge and transparency of a credible stock market. In addition, all products bought and sold on the StockX platform are physically inspected and verified for authenticity by StockX. The StockX exchange also supplies in-depth market analysis, individual portfolio tracking, historical sales and volume metrics. StockX has achieved various milestones since its founding. In January of 2017, Nike released LeBron James’ first retro sneaker directly onto StockX, ahead of retail channels. StockX TV, the company’s ‘Mad Money for sneakers’ web series, began airing in April of 2017. In September of 2017 StockX teamed with Eminem to raise almost $440K for hurricane relief. Shinola was founded on the belief that products should be well-made and built to last. Across a growing number of categories, Shinola stands for skill at scale, the preservation of craft, and the beauty of industry. Of all the things we make, the return of manufacturing jobs might just be the thing we’re most proud of. 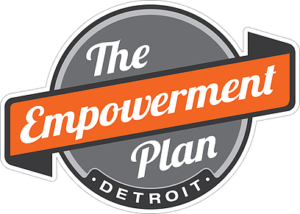 The Empowerment Plan (TEP) is a Detroit based nonprofit organization focused on permanently elevating families from the generational cycles of homelessness and poverty through employment. TEP hires single parents from local shelters and provides them with training and full-time employment as seamstresses so that they can earn a stable income, find secure housing, and regain their independence. The individuals hired manufacture a coat designed to meet the needs of those in the homeless community. The durable EMPWR Coat can transform into a sleeping bag at night or an over-the-shoulder bag when not in use. Since 2012, the organization has provided employment to 45 homeless individuals—all of whom have now secured permanent housing for themselves and their families —and distributed over 25,000 coats to those in need across the world. For more information, visit: http://www.empowermentplan.org/about. Detroit Children’s Fund (DCF) is dedicated to dramatically increasing quality school options for families across Detroit. 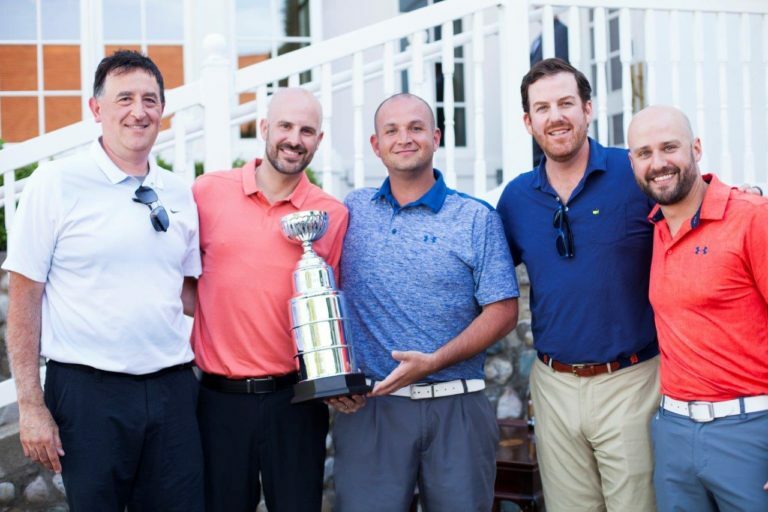 DCF raises philanthropic funds to support the replication of successful Detroit schools, the recruitment of proven school networks not currently in Detroit, and the development of Detroit’s teachers and school leaders. DCF’s coherent, coordinated strategy will create 25,000 quality school seats – spots in life-changing schools – or more by 2025. We know this is a bold goal, but DCF believes that if we approach this work with ambition, urgency, strategy, community, and resources then we can achieve great results for our children and our city. Visit ‪detroitchildrensfund.org for more information.